4 | 66 students enrolled. 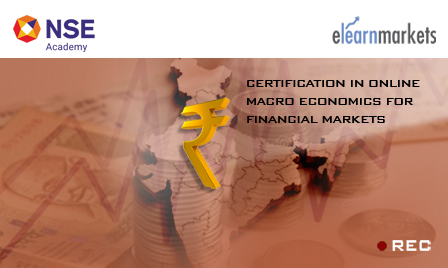 Certification in Online Macroeconomics for Financial Markets course is jointly certified by NSE Academy & Elearnmarkets (NSE Academy is a subsidiary of National Stock Exchange of India). Thsi course is designed to create an understanding of that field of economics dealing with the performance, structure, behavior and decision making of an economy as a whole, as an aggregate. It also teaches how to apply these principles to a wide variety of situations in both your personal and professional lives. In this way, the Power of Macroeconomics will help you prosper in an increasingly competitive and globalized environment. It encompasses in it such factors such as national income, output, consumption, unemployment, inflation, savings, investment, international trade and finance. This macroeconomics course offers students the intensive instruction and training required to successfully gain an insight into the economic growth taking place in the world and assess the situation thus resulting in sustainable job creation which improves living standards and overall economic development. It gives you the ability to determine the level of full employment, current and future financial state of a nation or a region, equilibrium in the balance of payments, equitable distribution of income and wealth. It develops your analyzing skills and you'll even be able to predict the effects of implementing new monetary and fiscal policy. Students enrolling for this Macroeconomics course will be given a “Certificate of Participation” from NSE Academy facilitated by Elearnmarkets.com, after successful completion of the course. Participants will also be given free access to related webinars conducted by Kredent Academy for further knowledge enhancement. An email query support, Question & Answer community platform can also be availed by the student for any kind of doubt clearance related to content while pursuing the course. Certification in Online Macroeconomics for Financial Markets course will aid students of commerce, finance, economics, banking, business administration, marketing, business aspirants, manufacturers of different products and services, job seekers and job holders.